Panning is a technique usually reserved for moving subjects, but you can use it to bring an artistic, painterly feel to your landscape images. When we hear the term ‘landscape photography’ we think of rolling hills, rocky mountains or maybe a seascape, but landscape photography can be so much more than a straight record of a beautiful vista. By using a slow pan and a longer shutter speed, you can ‘paint out’ fine details and textures in a landscape and come away with more of an abstract image. In landscape photography we’re often told that the golden hour is the best time to take photographs, but there’s an old gold prospectors’ saying which goes, “Go out looking for one thing, and that’s all you’ll ever find.” With this technique, you can go out at noon in bad weather and still come back with interesting shots. In fact, the time of day doesn’t really matter; from dawn to dusk, it’s all good. If you perfect the steps below, you’ll have creative, abstract landscape photos in no time at all. Look for a location with large, strongly-coloured features. Small details and subtle textures will be lost in the blur, so you can’t approach these images in the same way you would a normal landscape photograph. 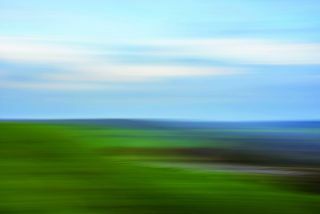 We found that the rolling green fields of Solsbury Hill in Somerset gave us flashes of colour, with textured lines from the panning motion. The best type of tripod head for this technique is one with a vertical locking feature, so it can pan sideways, but won’t tilt up and down – a three-way head or a dedicated panoramic head is ideal. If you’ve got a ball head, you can lock the head off and loosen the column nut, so you can still pan left and right. You can even shoot handheld at a push. Shutter speeds of between one and four seconds tend to give the best results. Try to pan slowly and smoothly, and keep the camera moving in one direction to make it look like there’s more intention behind the movement. You can either pan your camera horizontally, as here, or vertically. Trees with very straight, light-coloured trunks are ideal for vertical panning.